I still can't believe it has held on this long. They have a heck of a nice building for it (former Bonwit Teller) but otherwise... I'm amazed. They must keep doing good sales there. We moved in to Pleasant Run Farms just before the Grand Opening of Forest Fair Mall... I think it would've been either 88 or '89. We actually went opening day and I still remember it well! Time Out was AWESOME! I miss it so much.. Time Out was on the lower level right next to Super Saver Cinemas where movies at first were $1! They later went up to $1.50.. I probably saw 100 movies in that place! The food court was on the lower level right next to the movies and time out.. It is still there actually! Never burned down.. Although the only place open now I believe is a chinese place. There were some food places on the upper level near BIGGS including an Auntie Anne's, but it was not a food court. The Parisian was there at the grand opening and was part of the original anchor stores.. it was where the Brass Pro Shop is now.. The only Wal-Mart that I have ever seen be unsuccessful is the one at the Forest Park Exit. It's now less than 1/2 of the original size. Why? Shoplifting and bad checks. Same with the Kroger's down the street. It's one of the nastiest in town. That was the main reason for the initial failure of the Forest Fair Mall. The clientele that they expected to attract at stores like Perisian were put off by the trash from Forest Park that walked the halls with them and didn't come back. The trash that did stole more than they paid for the first year. Had the sand pit area of the Mall been there since the opening of the Mall in 1989? I was able to get my hands on pictures of the sand pit, but the images unfortunately focused mainly on the sand pit itself. What did it look like after the sand pit was filled around the late 90's? Where would that be in the Mall today? The Bigg's wing? Another question, what were the tenants in the Food Court during both incarnations of the Mall? I know Neo-FFM/Cincinnati-Mills had Subways, but besides that, I don't remember any of the tenants prior to 2013, as I had only been to the Mall briefly around 2007. I moved to Cincy in 1989 and am glad to have seen this mall when it was at it's peak. Although there were still a lot of vacancies back at that time, the optimism seemed to still be there. Returned some time in the mid 90's when there were a number of night clubs at the western end and portions of the mall had been partitioned off. About a year ago I was in the area, had some time to kill, and stopped in to wander through this now ghost town of a mall. Maybe it would cost more to tear it down than to pay the bills to keep lights and minimal heating and air running. That is my only guess as to why it is still there. To question of the food court being upstairs or downstairs, I do remember at least a couple of food stands on the upstairs level when the mall first opened. The main food court (including a BW3's) was on the lower level. Does anyone remember a fudge shop? 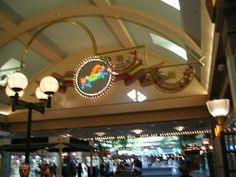 I remember it being on the upper level, across from the elevator that descended into the lower food court. man i miss those days at Bourbon Street. I liked all the different clubs. Bonsai Pipeline was the one i frequented the most. Spent so much time there i knew most of the bartenders. My fave was a guy named Dan, and Super Dave. Lots of good times and good suds. Remember Dan making me my first "Death Wish" like it was yesterday. I told him i wanted something with a kick, oh yeah! Hi! I'm the guy that used to keep all those games and rides going at Time Out. And I helped to tear it all down too. And if you want to read more about me and my other interests, go here: The PinWiz Page - Classical MIDI and more!